Warner's Stoker Stoves & Coal, Inc.
We would like to Thank all of our customers who came out to our Annual Customer Appreciation Coal Stove Cleaning and maintenance Seminar on April 6th! Stop by and check out all our stoves on display anytime and you can always pop in Kathy's Korner Gift Shoppe as well, she always has many unique items to see. We Would love to see you all! Allow us to introduce ourselves: Brad, Kathy & Jason Warner. Family Owned and Operated Business Located in Candor New York. Warner's Stoker Stoves and Coal, Inc.
We Carry Keystoker, Redding and Alaska Brand Stoves, They are on Display in Our Showroom & Available for Immediate Pickup. We Sell Automatic Stoker Stoves, Furnaces & Boilers. Parts and glass for Most Models Are also Available.We Offer Washed Premium Anthracite Coal, Available for Pickup or Delivery. Sizes Available Rice, Buckwheat, Pea, Chestnut, & Stove (Washed or Oil Treated). We also carry New England Wood Pellets, by the bag or by the ton. Quality Service and Fully Insured. "Our Commitment to Quality Speaks for Itself"
160,000 BTU double wall constructed Koker furnace has a 9" wide flat grate stoker and patented thermal heat exchanger. This popular furnace can be used as an add-on or used freestanding to heat your home. It comes with an opening on the front (3 X 25) and an opening on the top (11X19) to distribute warm clean air into your home. 105,000 BTU furnace has a 1000cfm blower, 200lb hopper, thermostat controlled, and fully automatic. 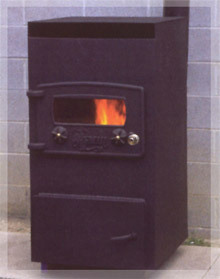 You can get a top or bottom vent or you can purchase a direct vent for this stove, if you do not have a chimney. Patented built in heat Exchanger that cools the exhaust air system and Flat Gate design. This mini furnace is great for small homes, garages, workshops, etc. where the koker is too large. The single wall 90,000 BTU and the double wall 105,000 BTU stoker stoves using the patented built in heat exchanger and flat grate stoker design gives you the highest possible efficiency in a coal stove. Sit back and enjoy the warmth of the popular keystoker stove and the savings of using clean burning anthracite coal. See advantages and learn about the great options on these popular stoves, Click on any stove Picture to go to the Stove Manufacturers web site. The Alaska Channing is a satisfying blend of economy and great looks. The Single Wall Channing heats upto 2500 sq. feet . With this great stove you get two controls, one is an Auto Control Box which is how you adjust your feed and the other is a Rheostate, this allows you to control the speed of your distribution blower. BTU's range from 5,000 to 85,000. This stove has a 100 lb hopper and burns rice coal. 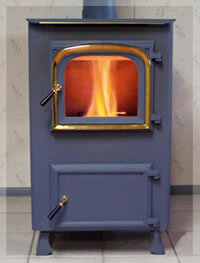 This stove is available in top, bottom, or bottom direct vent. Or if one of these is not what your looking for you can always use a power vent. THE HEART OF THE KEYSTOKER – A simple feed mechanism with very few moving parts is easily adjusted and maintained. Troublesome belts, sheer pins and worm conveyors have been eliminated. This feed mechanism with slow moving, long life parts keep service calls to a minimum. COMFORTABLE WARMTH -- KEYSTOKERS condition your home with clean even heat. Accurate controls and thermostat provide automatic well-regulated warmth with quick response to weather changes. Warm air, water, or steam heat are equally efficient with a KEYSTOKER unit. LOW INITIAL COST – Check and compare. Your dealer can give you the complete price of an installed KEYSTOKER. When you compare the cost of the KEYSTOKER with any automatic hot water heating unit, you'll realize how reasonable KEYSTOKER is priced.